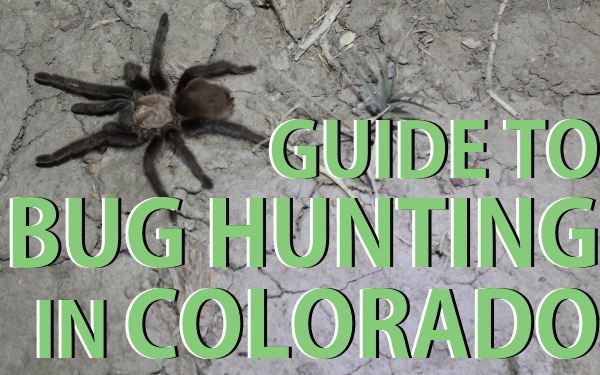 This is a series of blog posts about hunting arthropods in Colorado. 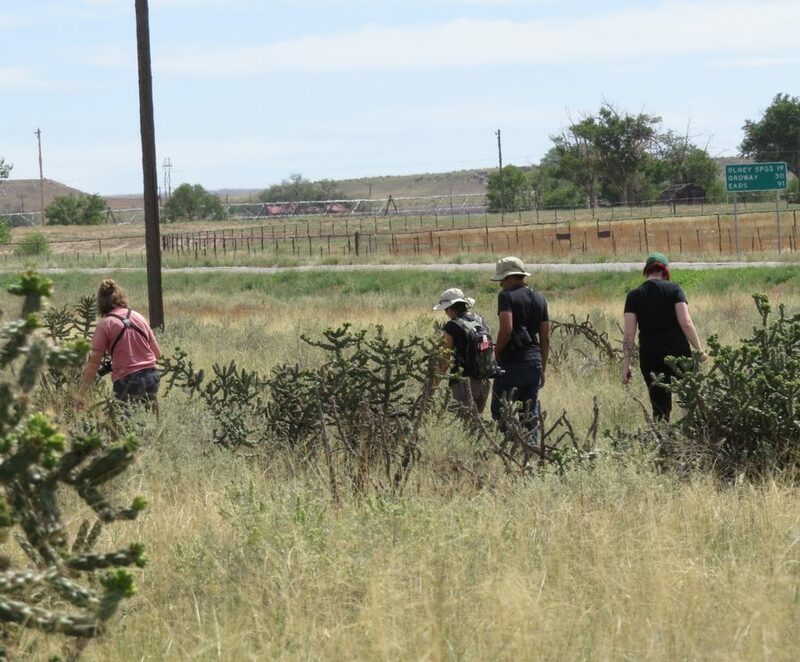 There are at least four species of tarantulas found in Colorado, and although we suspect the ones at the Pueblo County location are Aphonopelma hentzi, we would need to perform invasive procedures on a spider’s genitalia to know for certain. The single specimen Megan collected is alive and well as we speak. It takes even *more* skill to “fish” the occupant from her lair. Bell is highly skilled at this, and Jordan was able to capture the procedure in a video. Everyone was shocked to see such a large arachnid erupting from such a small tunnel. Whether a given spider is mature or not is difficult to assess. 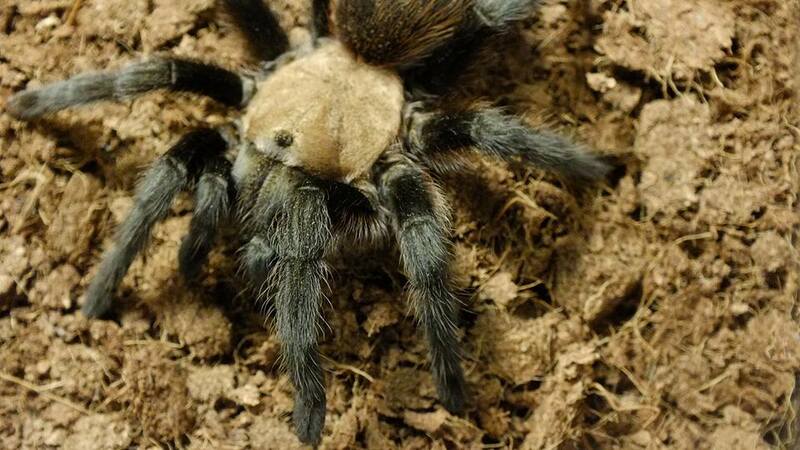 Male specimens change drastically in appearance upon their final molt into maturity, but females do not; and tarantulas are among the very few spiders that continue to molt after they reach adulthood. Upon returning home, Megan set up a spacious terrarium to house her new friend. 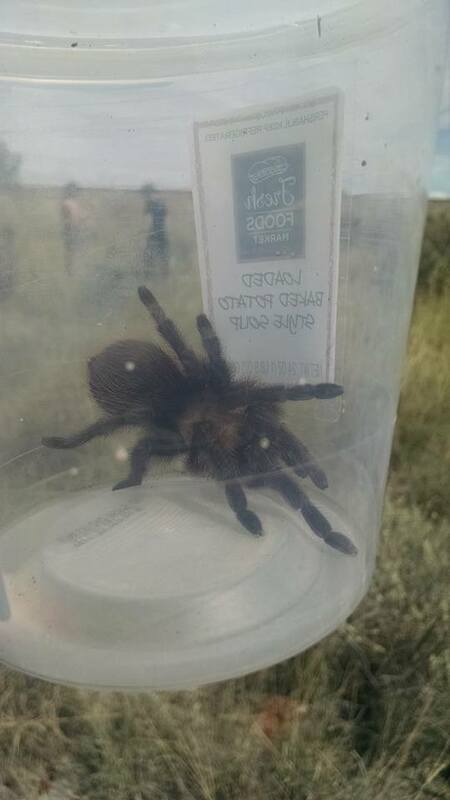 Since tarantulas are in high demand in the pet trade, we agreed that we would not disclose the exact location that we visited. We thank Ryan for sharing his “spot” even with us. Thank you for trusting! 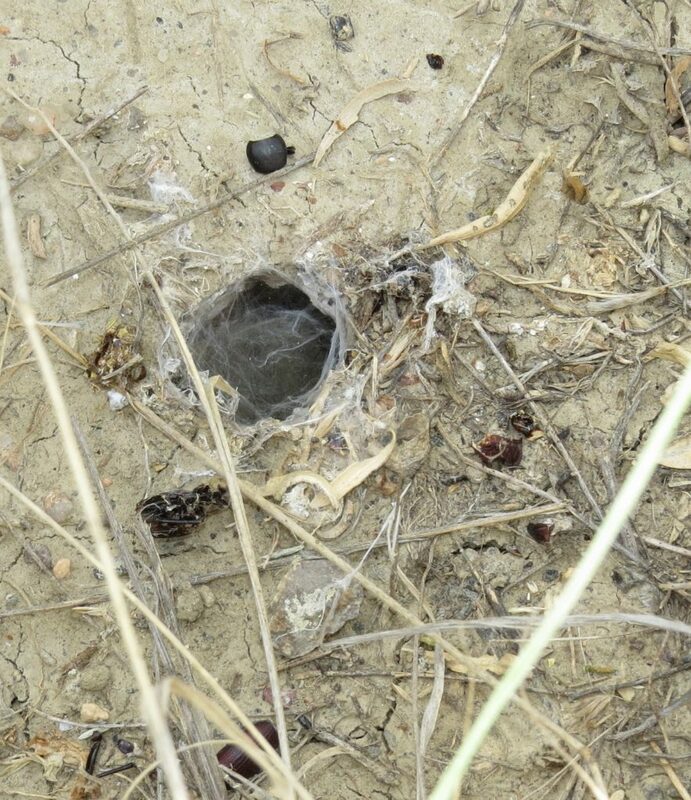 We found three occupied burrows altogether, but could only lure the one spider out. We did find other kinds of spiders, though. 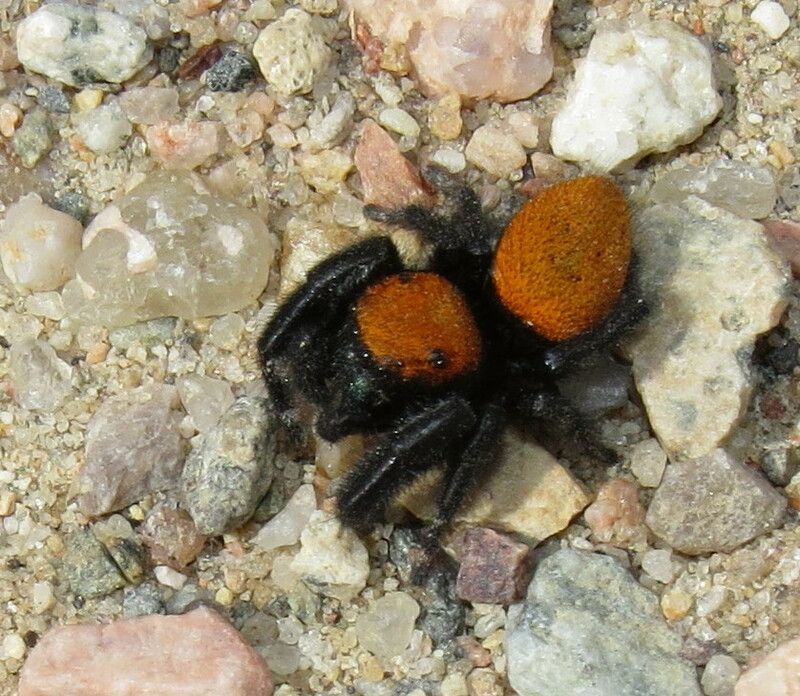 Before we had even ventured from the vicinity of our parked cars, we came across a lovely orange jumping spider, Phidippus apacheanus. 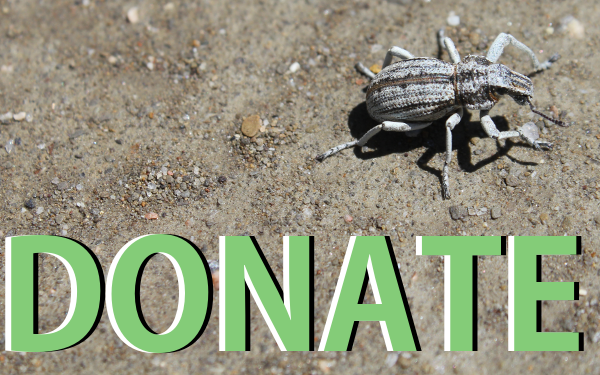 It is thought that this species might mimic velvet ants, wingless female wasps that pack a very painful sting. They certainly share the wasp’s bright “warning colors” of black and orange. 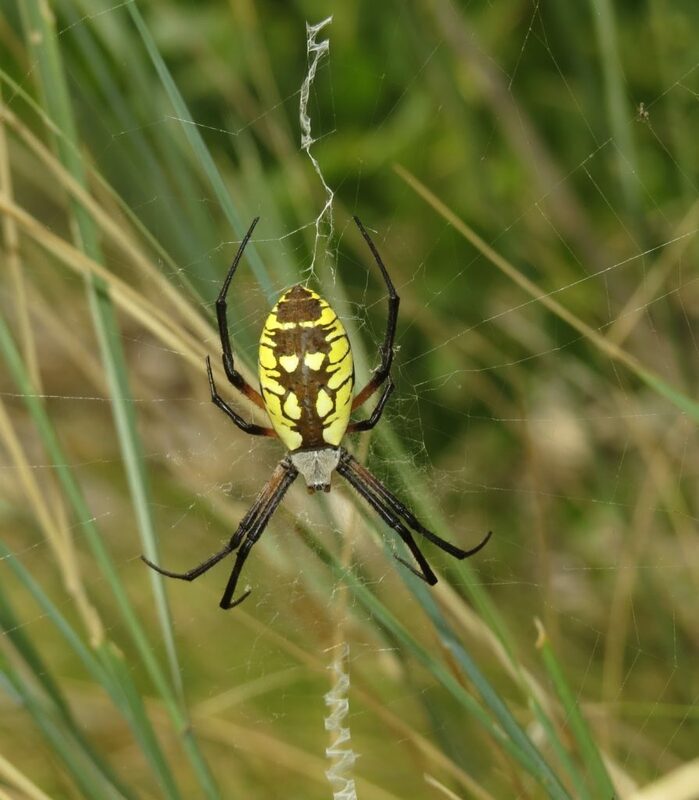 Heidi had an easier time noticing another giant, a female Black and Yellow Garden Spider, Argiope aurantia. 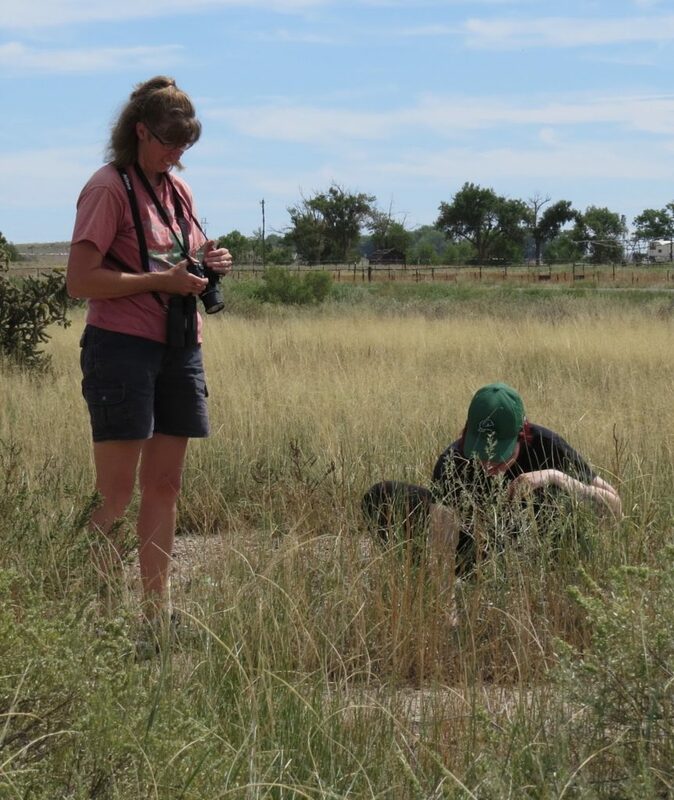 This species seems to prefer slightly more “open” situations, but still build their webs relatively close to the ground. 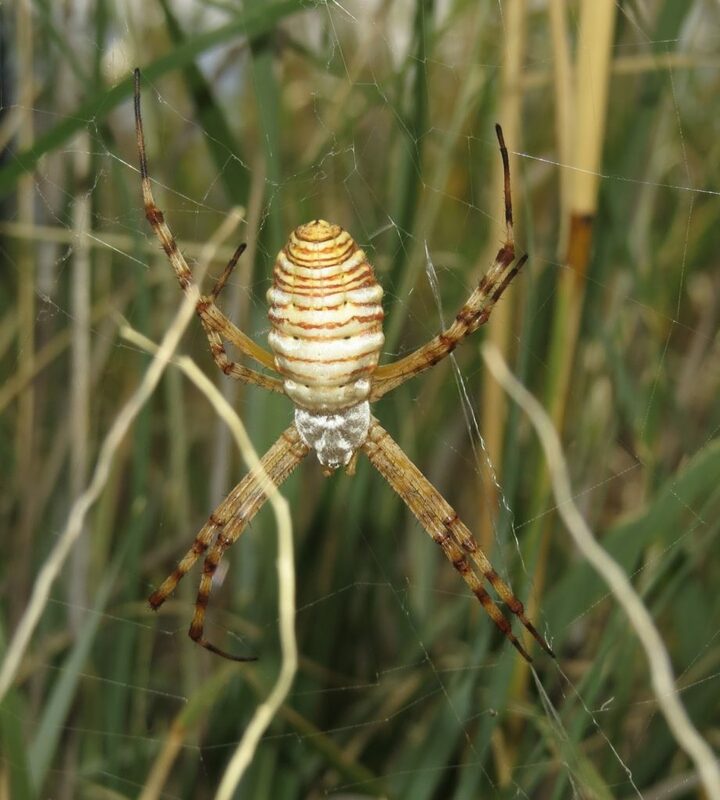 Both species of Argiope can easily handle grasshoppers and other large, strong prey that become entangled in their snares. 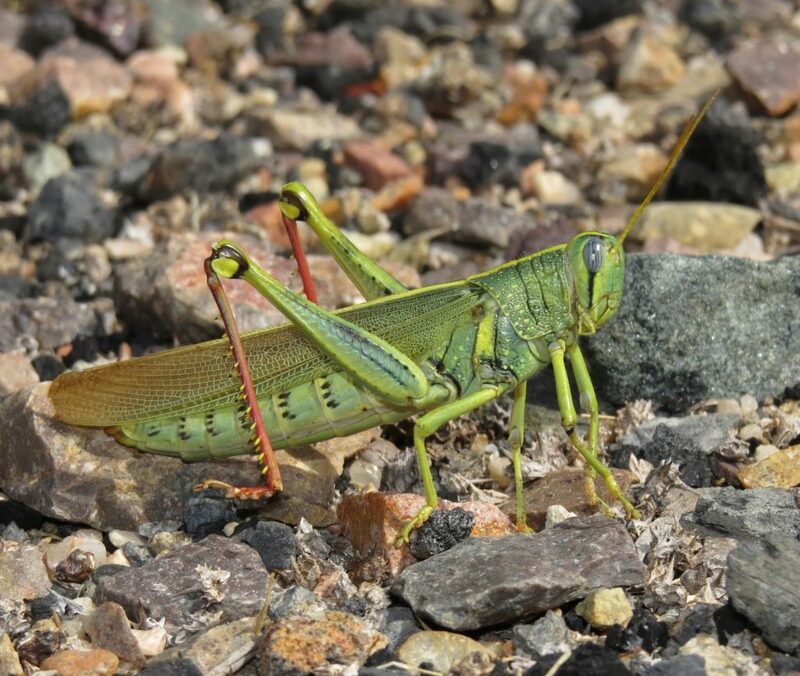 Grasshoppers certainly were plentiful, and diverse. They scattered at every step: Carolina Grasshopper (Dissosteira carolina), Two-striped Grasshopper (Melanoplus bivittatus), and Two-striped Mermiria (Mermiria bivittata) being among the most conspicuous. 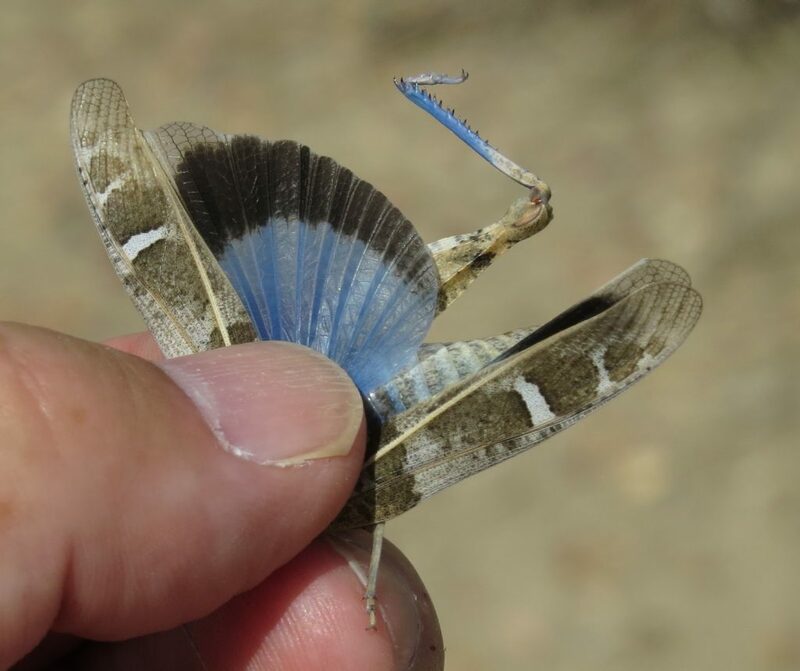 I also finally got images of the Ebony Grasshopper, Boopedon nubilum, and Saussure’s Blue-winged Grasshopper, Leprus intermedius. Black-winged Grasshoppers, Trimerotropis melanoptera,also made an appearance. 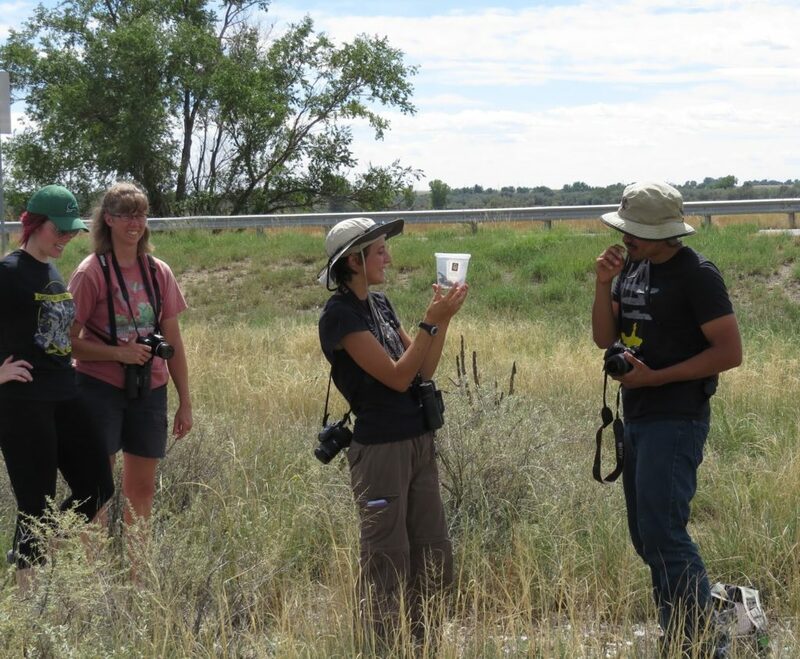 We concluded our expedition with a well-earned visit to the Dairy Queen back along the interstate at Pueblo. As we sat down I noticed a small spider on the outside of the window. 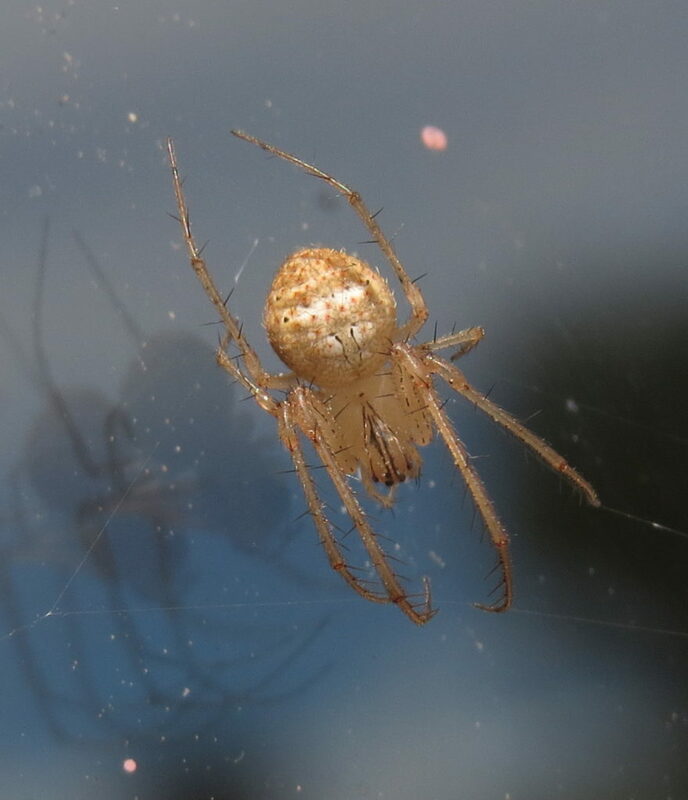 Tired and hungry, I nearly dismissed it as “just another orbweaver.” I am glad I took time to double check. It was a mature pirate spider, family Mimetidae, perhaps Reo eutypus, though I can’t be positive. You just never know *what* you will find, or where you will find it! Many thanks to my partners in crime. 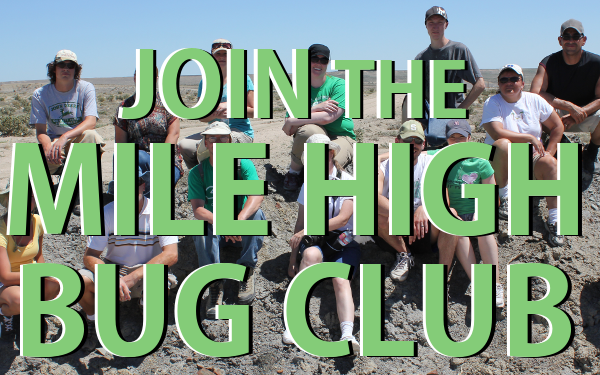 You all rock.